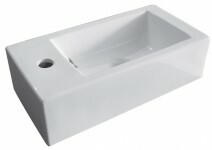 Rectangular handwash basin 50×24.5 cm with chromed overflow. Lateral faucet hole daim. 35 mm..